Learning how to deal with stress can reduce the impact it has on your long-term health and mental well-being. Depending on the stressor, there may be specific things you can do. For example, reporting workplace violence or bullying to superiors will go a long way towards improving how you feel if you happen to work in a place that understands the impact of workplace bullying and does something about it. However, as many have found out the hard way, reporting the abuse can simply be a way to set yourself up for even more harassment that sends your stress levels through the roof. (See: What Every Target of Workplace Bullying Needs to Know) But regardless of the stressor, there are certain things we should all do to relax. Learning how to deal with stress or the best ways that work for you is an important first step. People have different definitions of relaxation time. While some of the things they like to do are certainly enjoyable, they might not be that relaxing. In fact, things like vacations and happy events like getting married actually increase stressfulness. In order to truly de-stress and relax, you need some down time. Exercising regularly, being active and eating right are important, of course, but the average person needs about 20 minutes a day to do absolutely nothing. An anxious person needs twice that amount – a 20 minute de-stressing session twice a day. Those under extreme stress like targets of bullying may need even more. It may even be necessary to go on an extended stress leave. Yoga, meditation, clearing the mind, focusing on the breath and deep muscle relaxation are some of the techniques that can be used to truly relax the body and reverse the effects that stress-related bio-chemicals have on the body’s organs. Sitting in a comfortable chair, listening to soft music and lowering the lights, while counting the breaths, is one of the simple “how to relieve stress” techniques that works very well. One of the best systems available to learn meditation techniques also uses biofeedback hardware so you can monitor your progress and see exactly how your mind and body react to stress (and how to deal with stress) has been created by Deepak Chopra. For more information see our article on the "Secrets of Meditation" program. 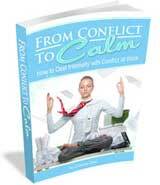 Everyone experiences stressful situations on a daily basis. We all have responsibilities, which are often enjoyable. The de-stressing recommendations mentioned above work for the common daily stressors, but they may not work for more traumatic events. Sometimes, it is simply a matter of time. For example, the loss of a loved one can cause depression and anxiety for some time. The same can be true for targets of bullying. Chronic and acute anxiety is typically stress-related. In other cases, professional help may be necessary to learn how to relieve stress caused by some event. For example, victims of violent crime often need counseling in order to stop living in constant fear. Victims of workplace bullying, harassment or other types of aggressive behavior may require counseling in order to reduce mental distress. Otherwise the distress can go on for years, eventually leading to complete disability or health problems like high blood pressure and heart disease. Normal daily stresses can lead to problems like daytime fatigue and burnout. Studies have shown that companies can help by introducing stress-reducing programs and encouraging their employees to participate. Employers should not initially try to teach employees how to deal with stress caused by bullying or harassment. They should advise their employees when they are hired to report those kinds of events and remind them on a frequent basis. A preventative program should be initiated if one is not already in place. Bullying takes root in workplaces where management is weak and/or incompetent and either allows or participates in bullying. Although daytime fatigue and burnout are frustrating to deal with, it is obvious that workplace bullying can lead to more serious problems. Rarely does burnout cause a person to become completely disabled to work. It may lead to a change of jobs or even a change of careers, but a victim of burnout can usually return to work. For the more serious bullying, satisfactory resolution of the situation is an important part of how to relieve stress for the victim. Yet, there are still considerations. Unless the bullying was severe enough to warrant the dismissal of the bully, the victim may have to continue working with the bully. A solution could be to transfer the bully or the victim to another department. When dealing with the victim, it is important that the person is satisfied with the new department. Managers should follow up, not assume that the problem has been resolved. Finally, targets of bullying, and the bullies themselves for that matter, need to learn how to deal with stress in a non-violent, non-angry, non-aggressive fashion. Otherwise, one day, they could become severely debilitated by the serious health effects of stress.